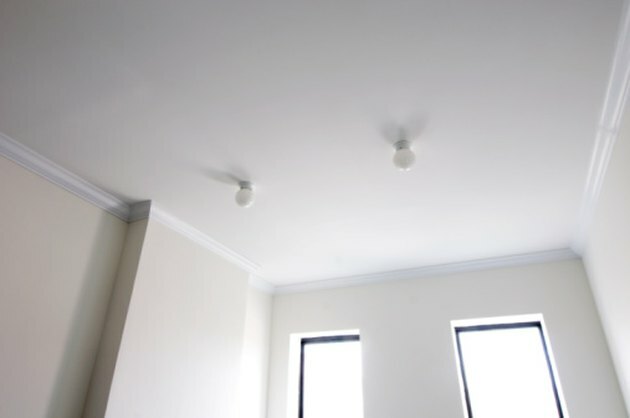 If you need to hang something very heavy from a ceiling, such as a ceiling fan, you always should attempt to hang the object from a ceiling joist and with a lag bolt. A lag bolt has very deep grooves in the threads for maximum grip. If you cannot use a joist to secure the heavy object, the next method is to use a toggle bolt. A toggle bolt uses a large collapsible nut to increase clamping pressure of the bolt. A toggle bolt is used for lamping heavy objects to drywall or lath. The process for using each type of fastener differs. If you need to hang something heavy, you must secure it properly to protect against its falling. Locate the joist with a stud finder and mark the center of the joist with a pencil. Place the mounting bracket for the object over the pencil line and center it on the joist. Mark the mounting holes with the pencil. Drill pilot holes using the pencil marks as a guide. Drill the hole approximately 1/2 the diameter of the lag bolt. Place the mounting bracket over the holes, Thread the lag bolts in as far as you can by hand. Use a socket and ratchet to drive the lag bolts through the rest of the wall into the joist. Inspect the surface of the butterfly toggle nut. On the surface you will see a number. That number indicated the drill size you need to drill the access hole in the wall. For example, for a ½-inch toggle bolt, you likely need to drill a ¾-inch hole. Place the mounting bracket against the ceiling and mark the holes with a marker. Drill the access holes with a hand drill and drill bit. Remove the butterfly toggle nut from the bolt. Place the bolts through the mounting bracket and then place the butterfly toggle nut back onto the bolt. Make sure the bolt is long enough to allow the butterfly toggle bolt enough room to collapse over the bolt. You should have at least ¼-inch between the end of the collapsed butterfly toggle nut and the back of the mounting bracket. This allows space for the thickness of the ceiling. Place the butterfly toggle bolts though the access holes in the wall. Once in the wall, the nuts will open up. Tighten the screws with a screwdriver. Lisa Wampler began writing professionally in 2005 and has published on various websites. She specializes in content writing and search engine optimization, drawing from previous positions as an account manager and a social media manager for an SEO company.